It is Sunday morning and the coffee pot just beeped and as happy as hearing it makes me, I can’t help feeling that yucky sense of dread. Sunday stresses can only be a matter of minutes away. They don’t always come when expected, mind you. Sometimes they can be held at bay for a really long time. A whole day. A week or two. Rarely longer. Sometimes on a long weekend they magically disappear. In summer they are practically nonexistent. I love summer. Or contrariwise they morph into Monday Stresses and no one needs that on a Monday because let’s face it some of us already have major issues with Mondays. Poor Monday. It gets a bad wrap. It’s just another day. Logically, we all know this, but if the traffic is bad or you forget your morning coffee or there is a pop quiz or the grocery store is out of that awesome bagged salad you so desire and desperately need, chances are it’s going to happen on a Monday. At the very least, that is how you’ll remember it. Tuesday is terrific. It’s got it made in the shade with it’s, ‘Yay! I’m Taco Tuesday! Everyone loves tacos. Go ahead and add some guacamole!’ swagger. Everyone loves Tuesday. Wednesdays are weird. They are either completely wonderful or the worst. It’s all a matter of perspective, I suppose, but some Wednesdays are all Peak Performance, eat all the right things, go for a great walk at lunchtime, skip the chocolate, take the stairs, do one more lap, days. While others are more, what’s for dinner, why didn’t I thaw that, oh shoot I have an appointment, I have to sign how many forms immediately, the bus is late, I might as well just eat that now anyway because I am already doomed, days. Thankfully, over the years, I seem to have gotten a handle on Wednesdays. I will them to be wonderful, more often than not. Typically, Brinner*** has its moment to shine during Wednedsay’s dinner hour. So easy and satisfying. Wednesdays, also tend to give me a WHAM! mindworm. If you are a WHAM! fan, I bet you know what I am talking about. Thursdays. Well, Thursdays have always usually been good. Once upon a time it was “Must See TV” day and who could possibly deny the awesomeness of that? Habits. They really can work in your favour, you know? Plus Thursday is Friday Eve and everyone is excited to welcome Friday back into their lives at the end of a long work week, right? Friday. You beautiful, happy-making, party all the time, sight for sore eyes, you. Are we ever glad to see you! You make the work week worth it and the school week tolerable. You make the secular among us religious – that’s power – if only for the time it takes to utter the letters T, G, I, and F.
I love Fridays. We always take the time to make Fridays fun. It doesn’t have to be fancy, but there are more Fridays than not, that are Friday Family Fun Nights at Chez Peady. We do enjoy our traditions. Sometimes it’s a movie night or a make-your-own-pizza night or a family game night. Sometimes we just relax and do our own thing, but Friday night is sacred. We try very hard to respect it and not make plans away from our Peady peeps! Saturdays are best, though. Hands down. Zumba, time to get stuff done around our space, relax. Even laundry feels like less of a burden on Saturdays. Now that’s saying something, because we all know how I feel about laundry. Saturday is the freest day. There’s enough time left in the weekend that even if you have a lazy start to the day you can ramp it up in the afternoon and evening – especially as the warmer weather starts to grace us with it’s presence. The peepers are singing. The air is warm. You can take a late night stroll. Go have some froyo (yo!). Pick out a movie to watch even though bedtime is approaching. On Saturday all bets are off. Here comes Sunday again. It happens every week. Sigh. 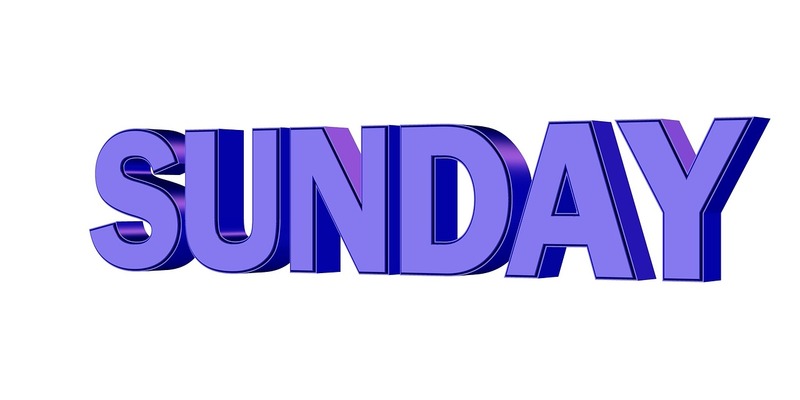 So what can I do to make Sunday less of a bitter pill? I can take a few minutes and set up my week so that Sunday is just another day, falling in line with the others, with a plan in place most stresses can be minimized. For me, for my Things, for all of us. I have not been very good at this lately, but the time has come. Today is Set It Up Sunday. Today I will make a plan for my week and I will reap the benefits of that basic plan all week long – including next Sunday when I do it all over again. I have taken a few minutes throughout the day today to set the week – and myself – up for success. Going outside to play. Every. Single. Day. So that’s it. That’s my pl****. It’s not quite a full plan, but it is certainly better than nothing and way better than my flying-by-the-seat-of-my-pants approach of late. Are you a “Fail to plan, plan to fail” kind of person? What happens when you make a plan? Tell me about your approach or what you find works best for you and yours. **Now that I brought it up, where are you? No really. I’m asking. Feel free to let me know in a comment. ***Breakfast for dinner! Brinner FTW! Try it! Here, here, or here!